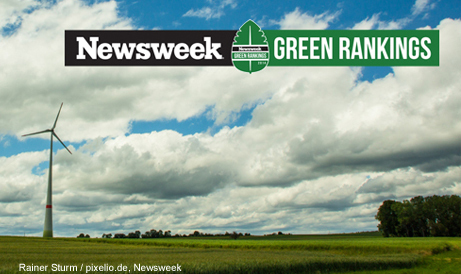 It’s back: Newsweek’s Green Rankings 2014 was published yesterday after a one-year pause in which the methodology had been under a complete reconstruction. As it is considered as one (or maybe even the) most important ranking on environmental sustainability expectations were high. And the news is: the new Newsweek Green Rankings will not meet all of these high expectations. While the new methodology was set up to provide more transparency, objectivity, better comparability etc. it contains a considerable flaw in one of its KPIs. Seven out of the eight KPIs, e.g. productivity scores for energy use, green house gas, water and waste look pretty reasonable. Data for these KPIs are gathered from publicly available sources and will meet the goal of being replicable by a third party. But the highest weighted KPI – reputation, making 20 % of the overall results – is a spike in the KPIs set. This KPI covers not only environmental but also social and governance dimensions. It is not disclosed if or how these dimensions are weighed – while already the mix of these dimensions is critical as a company could have positive reputation in environmental terms while it is considered a social “ogre”. The data set for the reputation KPI is derived from published news and opinions such as electronic and printed news, websites e.g. of NGOs, blogs etc. in a mix of automated search and evaluation by analysts. In short: this KPI, provided by the Swiss-based company RepRisk, its methodology and its respective results are a black box conflicting the goal of the Green Rankings to become more transparent and objective. Apart from that, it is arguable if this approach could cover the aspect of reputation at all. One additional missing piece of information: In the new ranking companies are only scored against their industry group peers while the ranking is an aggregated list. It’s not disclosed how this is derived methodologically. Newsweek’s Green Rankings is now provided by a well known player in the sustainability ranking business: Corporate Knights Capital, who is also compiling and publishing the “Global 100 Most Sustainable Corporations in the World“ ranking (see Rated Ranking here) every year at the WEF summit in Davos. Providing now two of the most relevant sustainability rankings worldwide, Corporate Knights has become an even more powerful player in the ranking business. Another result is monotony among indicators in two major sustainability rankings as half of the KPIs in the Green Rankings are similar to the (twelve) KPIs of the “Global 100” ranking. Newsweek Green Rankings still covers the 500 largest US and the 500 largest publicly traded companies worldwide. As there is an overlap the total universe of corporations scrutinized sums up to 809 out of 23 industries. With the new methodology comes a total new result list. The 2014 Top Green Company is Vivendi followed by Allergan (maker of Botox), Adobe and Kering a.k.a. as former PPR, owner of brands like Gucci, Brioni and Puma. Among the 2014 Top 20 there are only 4 companies that were among the top 100 in Newsweek’s 2012 ranking. Five companies were not even in the 2012 ranking at all. To sum up: New methodology, new companies in the top ranking but still the old issue of methodological inconsistencies.The results can be found on the Newsweek Website. Comment: Continuous publishing of the Ranking was interrupted in 2013 and is now published with completely new methodology allowing no comparison to earlier results. Comment: Interactive tables allow to rank and compare companies according to each of the defined KPIs or the respective rank within their industry. Comment: There is no consolidated description of methology. Considerable flaw in the definition of the reputation dimension.